Four Demon Accusations That Stop Spiritual Warriors . Demon powers know how to stop most Christians. You are not like most Christians. You can see what others don’t. How you see Jesus affects your life. Jesus was a spiritual warrior. After the anointing of the Holy Ghost came on Jesus He rebuked demons, faced Satan, healed the sick, and spoiled principalities and powers. He defeated death, hell and the grave. He is your redeemer and he is risen! spiritual warfare is part of Christianity and the spiritual warfare is not over. Historically, the rise and fall of spiritual power within the Church of Christ has been related to the acknowledgment and opposition toward demonic principalities and powers. As leaders recognized the spiritual warfare caused by demon powers they equipped believers to use their delegated spiritual authority to fight back. When leaders ignored the dark rulers of this world believers and the Church suffered. Warriors wear armor. Armor is for the fighting man. Paul likens spiritual opposition to warfare. He teaches five important truths. Christ’s followers should be strong in the Lord. Be full of spiritual power. Recognize devils have wiles or tactics. The battle is a spiritual battle not a natural one. Spiritual warriors wear God’s armor. The battle ready fight back. Paul uses terms such as soldier, fight, weapons and armor. Warfare means “armed conflict against an enemy.” As Christians we understand there are many spiritual enemies of Christ including demons, principalities and powers. Included in that list of spiritual enemies but seldom discussed are the systems, structures, kingdoms, and organizations that demon inspired people build. This is something worth thinking about. Christians should not yoke themselves with systems the demon influenced build like fiat money printing and exotic financial instrument schemes such as junk bonds, abortion clinics and drugs, or thief by political deception. These are the results of demonic influence. Satan’s cohorts come only to steal, kill and destroy. This is one way to identify them. Again, our battle is not against flesh and blood. Our warfare is a battle in the spirit that manifest in the natural. Win spiritually and things get better and better naturally. Lose spiritually and things get worse and worse naturally. This is where the Word of God and battling prayer become vital to the disciple of Christ. There are many different types of prayer. Not all prayer stops demon powers. Mature in the Word and learn how to pray. Are you afraid to discern the presence of demon activities? Some are. Demons influence people and their activities must be discerned. You can’t stop them by ignoring then. Evil spirits, spirits of infirmity, seducing spirits, spirits of error, unclean spirits, anti-Christ spirits, Jezebel spirits and divination spirits have infiltrated the Church. They target the high places of authority and power. Sometimes these spirits work alone and at other times they network together. 1.Don’t judge least you be judged. 2.Let the one without sin throw the first stone. 3.The measure you use to judge someone else will be measured back to you. 4.Take the beam out of your own eye first. The list goes on and on. Did you notice the devil will use the bible to stop bible believing people? Yes everyone should examine their own hearts “first” but spiritual discernment requires sound judgment. You must judge. To judge simply means to make a judgment. Making a judgment “is not” being judgmental. A judgmental person is a fault finder. That’s not what we are discussing. Christians should never be fault finders or false accusers. We are writing about spiritual discernment that affects lives. Remember, we wrestle not against flesh and blood, that’s people, but against demonic spirits. You make judgments every day. You believe what you hear or you don’t. No you are not judging any ones salvation, that’s between them and God, but you are judging what spirit they are flowing in and the fruit of their lives and ministries. Good trees bear good fruit. Bad trees bear bad fruit. This is where shared values and world views come. Listening to and being around people lets you know what they value. You make judgments during conversation and by watching people’s actions. What do they embrace? Value? Pursue? Talk about? Value based judgment happens every day. Scripture says, “Can two walk together except they be agreed?” (Amos 3:3). Shared values draw people together. Those core values govern your life. Values determine your relationships with others. Shared values empower folks to walk together. People fellowship with each other based on shared values. What you value you will pursue. What you value you will protect. What you value you will enjoy. What you value you will fight for. What you value you will keep. Decisions are based on what you value. Churches are built on shared values, political groups are built on shared values, organizations are built on shared values and relationships are built on shared values. Values differ. You spend time with people that value what you do. That’s human nature. Scripture says we are not to be unequally yoked together with unbelievers. How would you know if you are unequally yoked if you don’t’ make a judgment? In this scripture the Apostle Paul was not being judgmental against unbelievers. He was pointing this out for your protection. It is guidance for the sons and daughters of God. Christ authorized you to make judgments about people. Yes he did. Christ said, “You shall know them.” In other words, you shall accurately know them. To investigate, examine, enquire into, scrutinize, sift and question. As a judge would hold an investigation. To interrogate and examine the accused or witnesses. To judge, estimate, determine (the excellence or defects of any person or thing. Christ never taught his followers to ignore demonic spirits. Don’t let demon spirits use their weapons of mass deflection to stop your spiritual discernment. As already stressed, you are not to unfairly judge people, be judgmental, mean spirited and hurtful, condemn people or judge their salvation. This article is about demons stopping a Christian’s spiritual discernment. You must make judgments as you seek to weigh what you hear and what you see against the written Word of God. It takes spiritual maturity to see things as they really are. Demon powers know how to stop most Christians. You are not like most Christians. 11pm – 12.30am US Central Time. Apart from doing the 70 day prayer and fasting program. We are doing 40 nights with God on our prayer line. Fasting is from morning till 3pm with no food, no water. Please contact you doctor before starting a fasting program. This program goes from before you were born and cleans your foundation. Is reaches into your past to break ties with people, place and things that have held your moving forward. 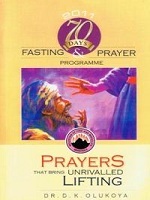 Please order you copy, join us or start a program in your church. See the daily topics for all forty nights.